Michael Bradley is the best outfield player on the US National Team. So why is he moving from one of Europe's premier teams to one of the worst teams in the mediocre MLS? Five years ago, Bradley was best known for being a coach's son; his father, Bob Bradley, managed the US National Team from 2006 to 2011. Michael Bradley's early reputation was as a hot-headed enforcer, typified by a three-game suspension in 2009 for chasing a referee down the tunnel after getting a red card. Many questioned if this coach's son had really earned his place in the team. But then US fans started watching Bradley more closely. They watched as he lit up the Dutch Eredivise for two years. They watched him as he thrived for three years in the German Bundesliga. Bradley's development as a player was clear. His tactical awareness as a central midfielder far outpaced any of his counterparts on the National Team, and he had a knack for scoring and setting up important goals. In 2011, Bradley moved to Italy to play in the Serie A for Chievo Verona. In doing so, he became the first American to play in Serie A since the well-coiffed (now) Alexi Lalas, who spent two years at Padova from 1994-1995. Italy has a reputation for being a very technical, tactically-astute league, which, if you believe the stereotypes, doesn't exactly appeal to American players. Bradley thrived. He made 35 appearances for Chievo in the 2011-2012 season, and finished with the second highest match rating of anyone on his team, according to WhoScored.com. 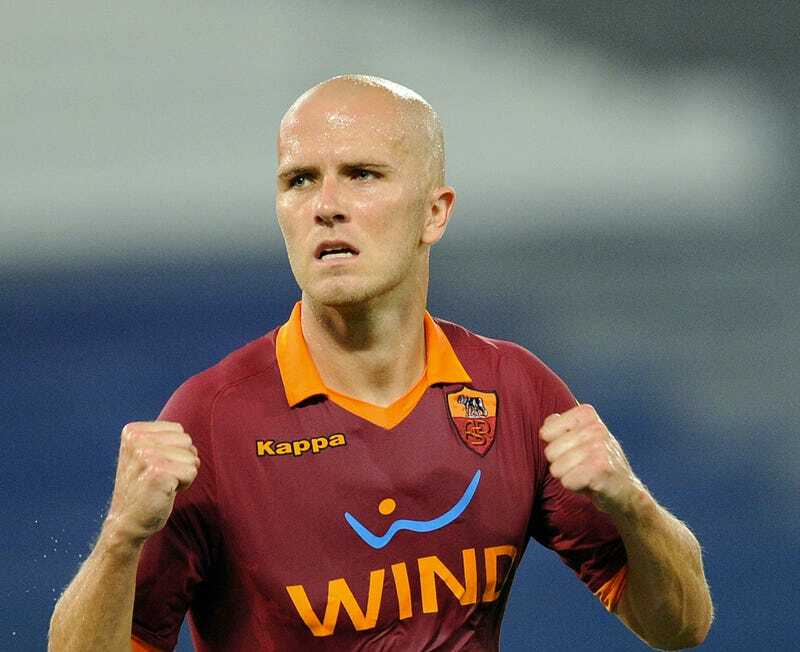 After only a year in Verona, Bradley was acquired by AS Roma, one of the traditional powers of Italy. Although he saw his playing time slightly diminish, Bradley still made 30 appearances for Roma in the 2012-2013 season, chipping in two assists. Back in August, Luke O'Brien published a fascinating article on this website discussing Bradley's impact in Italy. O'Brien interviewed Roma fans to get their opinions on Bradley; they agreed he was a solid, dependable player. His nickname, Il Generale, described his calm, controlling demeanor on the field. The hot-blooded coach's son was now, as O'Brien puts it, un giocatore: a player. But Roma had ambitions of improving on their 6th place finish in the league in 2012-2013. Over the summer, they signed the Dutch midfielder Kevin Strootman, a highly prized player who plays a similar role to Bradley. Roma shelled out 17 million Euros for Strootman, so he was always going to see more playing time than Bradley, a 3.5 million Euros signing himself. In the first half of the 2013-2014 season, Bradley played sparingly. He's made 11 appearances, with only five starts. But his Roma team has exceeded all expectations, currently sitting second in the table. Bradley has played well when called upon, though he hasn't really had a chance to make his mark on the team. And then Roma signed another central midfielder a few days ago, this time a Belgian named Radja Nainggolan. Nainggolan is an almost identical player to Bradley; both play box-to-box, relying on their physical strength to win the ball. The move meant Bradley's time at Roma was coming to an end. Fortunately, there were rumors that he had offers from teams in Italy, Germany, England, and the Netherlands. It turns out Bradley's destination was a lot closer to home. Surprisingly, the scoop was broken by Taylor Twellman, a former USMNT'er turned color commentator. Right around the time everyone was freaking out about the Hall of Fame announcements, Twellman reported that Bradley was about to sign with Toronto FC, of MLS. The instant reaction was shock. Toronto FC finished in 17th place out of 19 teams in the 2013 MLS season. They were absolutely putrid. The 16th place team had 12 more points than they did. There are glamour franchises in MLS – teams that have a plan in place and execute, like Los Angeles, New York, or Kansas City – and Toronto is definitely not one of them. What they do have, though, is a major market. And with that comes money. According to speculation, TFC (and MLS) put up 7 million Euros for Bradley's transfer, double what Roma paid for him originally. Reports on his yearly salary vary, but it should be well north of one million dollars. For a guy who is recently married and has a young child, you can't begrudge Bradley for wanting financial security. But can it be a good thing for a player to go from the equivalent of the Los Angeles Dodgers to the equivalent of the Toledo Mud Hens? The answer is probably mixed. If there's any player who will make sure he's in form for the World Cup this summer, it's Bradley. As long as he receives regular playing time and doesn't get hurt, he should be a breakout star in Brazil. And it's also possible the move to Toronto is short-term, and he'll move elsewhere after this summer. But at the same time, it's a little unsettling, as a fan, to see one of your country's best players come back to the US. I'm one of MLS' biggest proponents, but it's just not at the point where we want all our best players playing in the domestic league. The competition's just not quite good enough yet. And that's why fans are concerned. We want to see our players test themselves against the world's best. We want to see that American soccer has reached a higher level, and that our players can compete with anyone. But these are just concerns of fans. Players have families to take care of, and personal goals to achieve. It's stupid to call Bradley unambitious or weak for not staying in Europe. The move is perplexing for fans, but ultimately I doubt it will materially affect the US's chances in Brazil. Bradley's too good, and has enough professional experience, to have something like this affect his play. In the best case scenario, the transfer becomes a forgotten story. Bradley stars for Toronto, and carries the USMNT to glory in Brazil. Then no one will care if he transfers to Roma, Toronto, or anywhere. Well, maybe still Chivas USA. For more updates on the Bradley saga and other general notes, there's always Twitter.